My Swisher card. Take it. Greetings from sun-drenched Indians Spring Training! 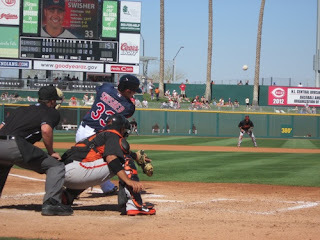 I am blogging my experience on TribeVibe for the Indians, so please check it out there. But my experience in a peanut shell has been awesome. When I arrived, I had planned on doing some sort of giveaway, because I'm happy to be here and I'm darn excited that the Indians are letting me blog for them. I thought it would be a fun way to say thank you and share the experience with everyone snowbound in Cleveland. Today, I chased down Nick Swisher after his awesome game for an autograph. I wanted to get my bat signed and a card for my friend I left standing at the fence. Turns out my friend would rather I gave the card away to another fan. And, in the interest of good karma and Nick not thinking I am an autograph piggy - here is a giveaway. 1. Leave a comment telling me why Nick Swisher is awesome. 2. 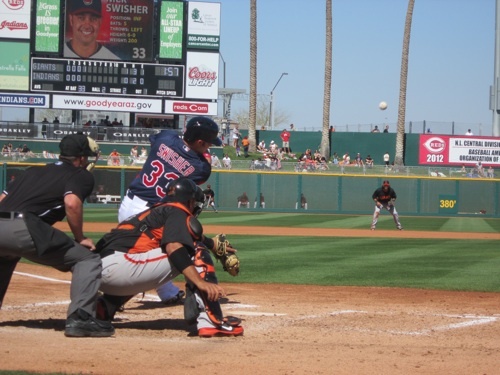 Tweet the following: "I want to win the signed Nick Swisher card from @ClevelandChick! http://bit.ly/16cNss5"
3. Leave a comment about what you are looking forward to most this Tribe season. You have until Saturday, March 9th at noon to enter. You can tweet once per day. Let's face it, if you tweet more than that, people will want to hurt both of us. Disclosure: I really don't want to be an autograph piggy and I just want to show my gratitude to all of my fellow Cleveland fans. Go Tribe! Nick Swisher is actually PROUD of the fact that he came to Cleveland. Wish I could say the same about other professional athletes. That's love for the city and why Swish is awesome! Nick Swisher is awesome because he knows what it means to be an Ohioan. Nothing is better than having someone who knows ohio on our team. He also has brought a spark to our team with other new guys. The clubhouse has been sounding like a blast with loud music, jokes, and seeing their smiling faces all the time during spring training. Also have you seen his batting average enough said haha. The thing I am looking forward to the most this Tribe Season is having baseball back in Cleveland. I attended the Tribe Fest and it got me more pumped for a season then ever. I look forward to summer every year because it means Tribe baseball but after Tribe Fest seeing the players, owner, manger, and workers excited for the season makes it just even more special.